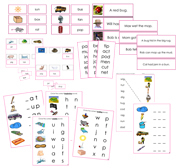 16 Montessori Pink Language Series materials. 15 Montessori Blue Language Series materials. 20 Montessori Green Language Series materials. 16 Montessori Step 1 Language Series materials. 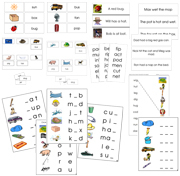 15 Montessori Step 2 Language Series materials. 20 Montessori Step 3 Language Series materials.